It was another chugfest. 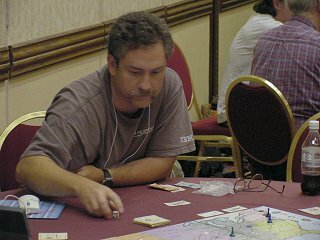 The 2003 Rail Baron title was claimed by Mike Zorrer in a quickly played and very close final match. As in 2002, no former champions advanced past the semi-final round, but all 6 finalists were experienced players and some were former finalists. 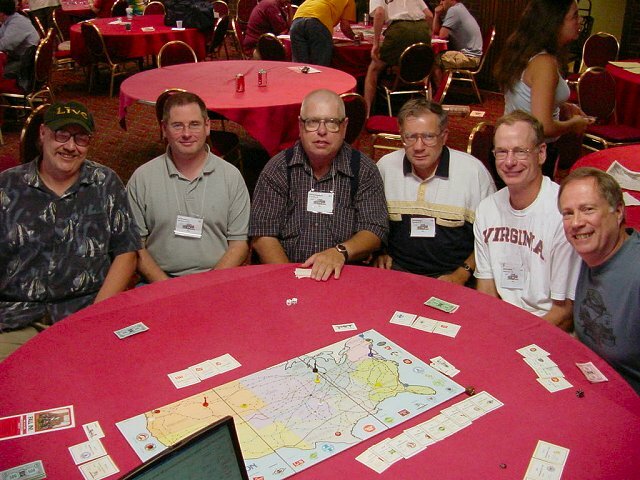 In turn order, they were Bill Crenshaw, Ron Secunda, Mike Zorrer, Brian Conlon, Charles Ellsworth, and Carl Walling, Jr.
Finalists, from a field of 59, pictured from left to right: Mike Zorrer, Brian Conlon, Charles Ellsworth, Carl Walling, Jr., Bill Crenshaw, and Ron Secunda. Bill started and risked keeping his home city of Detroit rather than swap it for Tampa. In general, NorthCentral cities make the best homes, but in this case the decision would cost him as his roll of 2 did little to establish him on either the SAL or ACL. Ron swapped to get New Orleans as his home instead of Charlotte, and Mike did similarly to get Detroit as his home rather than Richmond. Brian kept his home of St. Louis, and was bound for Billings; his was the longest first trip of the match. Charles's Chicago home is one of the best home cities, but his first destination was the unfortunate Miami. Charles did not home swap, either missing his chance or deciding to mimic last year's champion. 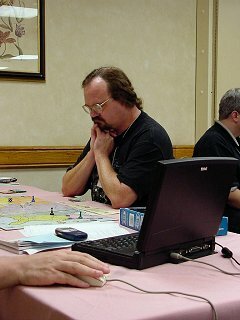 (Ed Wrobel, 2002 champion, had swapped so as to rid himself of Miami as his home and instead get Kansas City, even though that meant risking Miami as his first destination. Ed knew his chances were much worse with the remote Miami as a home city; in fact, this situation cuts the chance of winning in half!) By comparison to those of the other players, Carl's first trip from Milwaukee to Baltimore was tranquil. In round 2, Bill rolled 4, again too little to establish on either the SAL or ACL. Ron arrived, and smelling the blood of two Florida-bound players, purchased the SAL. Mike also arrived, and wanting to not be left out of the evolving feeding frenzy, bought the ACL. It looked like a cut-throat match was developing. A roll of 11 bought Brian to his destination, where he collected enough money to reach $31,000. He briefly considered the PA and NYC, but chose to purchase nothing. This conservative approach proved wise because his next trip turned out to be to unfriendly Tampa. As Charles continued to Miami, Carl arrived, collected $8,000 and also purchased nothing. Your GM was surprised that neither opted for the bargain NYNH or B&M. Round 3 saw Bill roll 9 and get closer to Tampa without paying anyone. Ron's next destination was the innocuous Little Rock, Mike's San Diego, and Carl's New York. In round 4, Bill was the first to bleed $5000, arriving in Tampa and choosing to pay Mike for use of the ACL; he knew Ron would be collecting for Charles's trip to Miami. Bill also purchased nothing. Ron arrived this round and picked the DRGW, and Carl bought the SOU. Upon arriving in Miami, Charles upgraded to an Express. Mike ended up collecting $5000 twice from Bill while Ron collected $5000 three times from Charles. Perhaps due to all the SouthEast activity, railroad purchasing proceeded in an unusual fashion. The PA did not sell until round 8 when Brian paid for it upon his second arrival. Bill did not make his first purchase (NYC) until round 9. Mike grabbed the B&O later that same round, and Ron the C&O two rounds later. The first big western railroad went to Charles when he stretched his wallet and surprisingly chose the UP in round 12. Carl went next, arrived and selected the ATSF, a fortuitous choice since in the next round Mike would be sent to San Diego. Three rounds later the race for the SP was won by Bill, who managed to overcome a bad start and build the foundation of a decent network with the NYC and SP; now he just needed to connect them. Soon thereafter Charles was bound for the distant Portland ME and Ron for Boston, so Mike capitalized by buying the B&M. Then a series of low rolls (6, then 3, then 4) ate up Charles's cash and he was forced to sell back his C&NW to the bank. 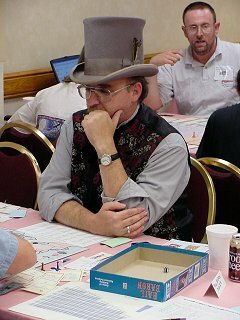 Eyebrows were raised when during his next turn he sold back his last railroad, the UP. The very next round (number 20) Ron completed a long, 8-turn trip from Los Angeles to Boston, which garnered him enough money to not only pay for use of Bill's NYC and Mike's B&M, but also buy the UP, giving his network a desperately needed boost. With no railroads, Charles survived only two more rounds, marking the only bankruptcy of the 2003 tournament, and the first in the final since 1998. Bill managed to connect his network via the MP, and Mike built a path to the NorthWest via the CB&Q plus NP. Rather than purchase the GM&O or IC, Brian upgraded to a SuperChief in round 29. When in round 30 Carl purchased the IC, the last unowned railroad, the brisk match was just 2 hours old, and found the cash and railroad networks as follows (listed in order of purchase by each player): Bill: $64k, NYC, NYNH, SP, MP, C&NW; Ron: $28k, SAL, D&RGW, WP, C&O, UP, SLSF; Mike: $44.5k, ACL, B&O, RF&P, B&M, CB&Q, NP, GM&O; Brian: $40.5k, PA, CMStP&P, L&N, T&P, plus SuperChief; Carl: $13.5k, SOU, ATSF, CRI&P, GN, N&W, IC. Given that only Bill and Ron owned both a major NorthEastern and SouthWestern railroad, they seemed to the be leading candidates for the victory. Mike soon upgraded to a $28,000 SuperChief, followed the next round by both Bill and Ron. It was fortunate Brian had purchased a SuperChief before use fees rose to $10,000, because he immediately made a pair of unfriendly trips (Salt Lake City and San Francisco). The experienced players kept the match chugging along quickly, and spread rail use fees equally so that no one jumped to a big lead. In round 47, Portland ME proved to be difficult for yet another player, as a trip there forced Carl to auction his IC. Ron added it to his network via a winning bid of $21,000. In round 49, Bill was the first to announce reaching $150,000; in fact, his Los Angeles to Cincinnati payoff bumped him all the way up to $170,500. As if the dice gods sensed someone had too much of a lead, immediately Bill began a string of difficult trips that knocked him back below $150,000: Charleston, Baltimore, then Atlanta, all unfriendly, with Mike and Brian the primary beneficiaries of the associated rail use fees. That same round Mike announced, followed by Ron the next round. Meanwhile, Brian was making trips from Atlanta to Los Angeles to Mobile, riding Carl's ATSF most of the way and paying him for 5 consecutive turns. Even so, Brian was able to announce and Carl wasn't. During the same period, Mike was collecting a few rail use payments while making long, friendly trips. His bank account ballooned from $151,000 in round 53 to $203,000 in round 58, and then to $235,500 in round 62. A cash check in round 63 showed Mike with $235,500, Brian $221,000, Bill $189,000, Ron $171,500 and Carl less than $150,000. Tension mounted as now, with the right next trip, any of 4 players could win. In round 66 Bill arrived in Norfolk, just 12 dots from his Detroit home, but he had $199,500, not enough to declare. Later that same round Brian arrived in New York; with about $240,000 but 13 dots distant from his St. Louis home and both Bill and Ron hovering in the vicinity, he decided to not risk declaring. Ron's next destination of Portland, OR was far from his New Orleans home, so he decided to continue hovering in the NorthCentral / SouthCentral area as Mike approached Atlanta, where he would be just 11 from his Detroit home. This put Ron in the best position to rover Mike if Mike declared and failed to roll high enough to reach home. Despite the danger, in round 70, Mike declared and rolled 11, exactly the minimum he needed for his trip home for the win. The final match was completed in only 4.5 hours, the shortest duration your GM has seen for a 6-player game. The credit goes to both the quick play of the participants as well as time-saving rule variants. 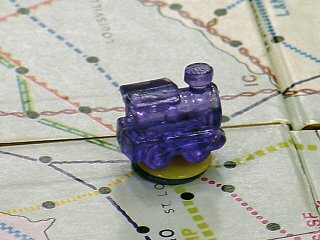 The entire tournament was played with the "ride-free-on-your-own-railroads" variant. 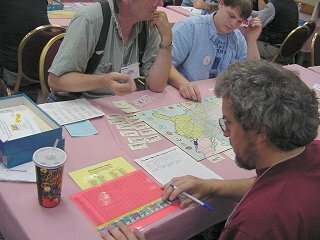 Additionally, participants were allowed to use the Boardgame Conductor of the RB Player computer version to speed up the tedious destination and payoff chart lookup task. The average duration of a first round match was slightly over 3 hours, and more than one first-round match finished in under 2.5 hours. These durations are an hour shorter than those experienced just a few years ago. I think we've reached a stage in which the matches are about as fast as they are reasonably going to get, and so don't plan any further changes. The 59 total participants played in 24 first-round matches, producing 24 different winners who advanced to the semi-finals. 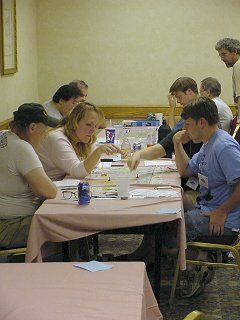 Twenty-two of those showed for the semis, and 3 alternates were promoted to fill out the five 5-player tables. One of those alternates was champion-to-be Mike Zorrer. Small prizes of pewter train game tokens were awarded to all the winners. The "Power-of-the-Pennsy" award was taken home by David Fox who won his first-round match despite the lowest value network ($112,000). Cheryl Merica claimed the "Rockefeller Award" for winning her first-round match with the most cash ($312,500). 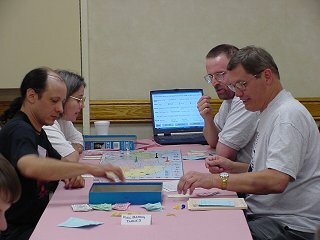 About 70 people are expected to compete in the 13th Annual Rail Baron tournament at the 2003 World Boardgaming Championships (WBC) this coming summer near Baltimore. You don't need to be an expert player; if you simply know how to play, you can join the fun. Writing the players' destinations on the match records sheet will be optional. This speeds this task. Bonus Points are renamed Alternate Points. Steve Okonski is resuming the GM role after a 1-year break. I expect the combination of these changes will keep the matches moving faster than even before. I anticipate some 4-player tables will finish in under 3 hours. There are some changes from the way the tournament has been run in recent years, so please read. You are encouraged to bring a laptop computer for use at the tournament as described in the next box below. Another way to advance to the semi-finals is by accumulating Alternate Points (named Bonus Points in past years). Alternate Points determine the alternate players who will be eligible to round out the semi-final tables. The Alternate Points you earn during all three first-round heats are added together. The people who accumulate the most will be at the top of the list for advancing to the semis as alternates. The idea behind Alternate Points is to encourage everyone to keep the game moving along. As an experiment, the BPA is allowing us to use laptop/notebook computers this year to assist with the game's chart lookups (destination and payoff). Use is optional, and must be agreed to by all players at that table. The computer's screen must be large enough for the text to be visible to all the players. 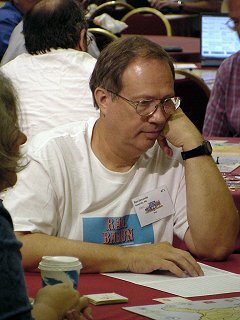 To do the chart lookups for you, you must employ the Boardgame Conductor in the RB Player computer program, version 2.8 (or newer). You may not use any other portion of the program or any other Rail Baron related program during the tournament match. Trials indicate this can shave 20 to 30 minutes off the match duration. Remember: the faster you finish, the more Alternate Points you get. In addition to the prizes normally offered by the WBC, we will also award a small prize to all first round winners. #1 - NEW FOR 2003! Ride your own RRs for free:. Do NOT pay the customary $1000 if you use your own RRs but not the bank's. Riding the bank's RRs for any portion of a trip costs the usual $1000. Tests indicate this speeds up the game by almost 10%. If a match is running longer than the expected duration, the GM will adjudicate it (declare the match ended, and pick a winner) upon request if more than half the remaining players in that match wish so. At his discretion, the GM may also adjudicate a match that is running longer than expected. The GM's decision is final. 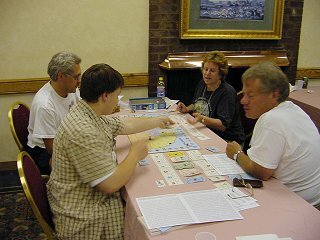 Adjudicated tables receive 1 Alternate Point per player. Due to time conflicts with other games, it is likely one or more semi-final and final slots will be unclaimed. For example, in a prior year, two of the six final slots were unclaimed and were filled by others. Thus, even if you did not win during the prior round, but have a high Alternate Point total (for the semis), you should check in because you might advance. Alternates for the final will be semi final second place finishers with the highest net worth. If, after 10 minutes past the scheduled start time of a round, there still remain open table seats, these seats will be offered per BPA guidelines for byes (byes into the semi-final will be in order of most recent champion, byes into the final will be in order of AREA rank).